Yes, it got progressively worse, partly because my right achilles tendon was hurting a bit. I really need to figure out what I am doing to my right leg that is causing this. I tried changing both how I was picking up my foot and landing my foot and managed to not feel any pain on the 3rd mile but I definitely do something wrong when I just want to go as fast as I can. I also felt the worst on the first mile but I think it was that feeling of being uncomfortable that I have to get used to if I want to get faster. 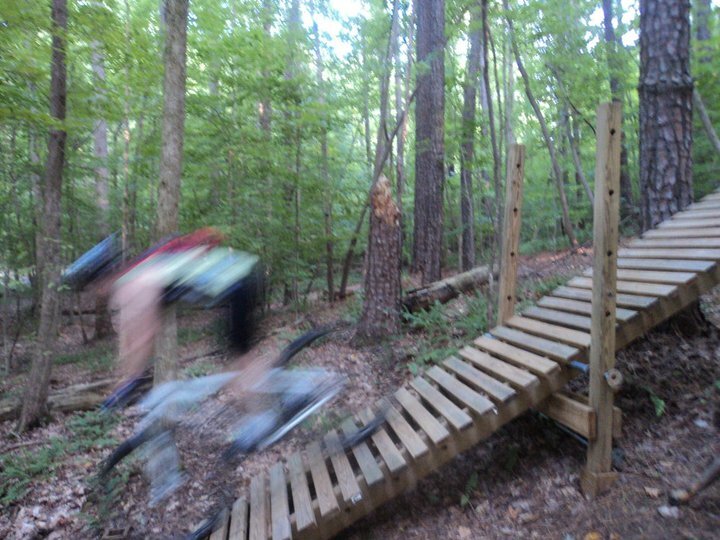 The 202 program is for graduates of the 101 program, or anyone that has already mastered the basics of beginner level Downhill riding and is looking to improve their confidence and skill on Blue Trails. Focal points during the 202 program include line selection, drops, jumps, and bike control. 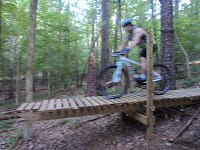 Any weekend that isn't a "race event weekend"
Camp includes professional instruction, two nights lodging, two day bike and equipment rental, two day bike park access, professional instruction from IMIC coaches. IMIC Certified Instructors for a private coaching session. Includes optional ($$) HD video analysis. Can have coach work with me individually or with up to 3 more people, might be a good option for me and 2-3 friends. Website gave details on what you will learn but no specific dates, I expect everything would be done at Dupont State Forest, I've gone there once and it was a great trail system, definitely a place where I could practice skills and learn more technical stuff. No Forged Fitness this morning as I am in Maryland for the long weekend. I got to use a cheap weight bench in my parents' basement to do bench presses. I'm more motivated now to do bench presses because there is a 5K race on 2/11/12 (Run for the Roses in Raleigh) that includes a "Pump 'N Run" option in which women will be required to bench press 50% of their weight and men will press 100% of their weight. For each press, 30 seconds will be subtracted from one’s 5K time. Awards will be presented to the three males and three females with the lowest net times, I don't think I am real contender but I like the idea and want to give it a shot. For me, this would mean bench pressing 65-67 lbs depending on my weight the day of the race! So tonight I did 66 lbs (I weighed the bar with plates using a scale), I was aiming for 3 rounds of 10 reps but my mom forgot to hit the record button on my last round so I ended up doing 4 rounds of 10 reps in order to get a video of the bench pressing. I also did 10 air squats in between each round and 100 situps using the Abmat. It was hard getting the last rep in for each round of bench presses so I need to work on this if I am going to bench press at 65 lbs for 20+ reps pre-5K race! One thing on the bench press: every time I extended up, I pretended like I was pulling the bar apart at the top, this really helped to keep the bar level and not let it go lopsided when the weight started to feel heavy. Mountain Bike Marathon 2012 January 29th 42 mile MTB (Open Women) Time: 5:05:54, Dead Last! For the pullups I looped a medium size band around the pullup bar and placed my foot in it to help me up to do the pullups (I still can't do one without a band assist!). For the overhead squats you have to use a wide grip to hold the bar above your head with active shoulders, squat and repeat, the bar always stays above your head with no movement of the arms. The Rx was 45lb but I should have used 55lb because the overhead squats were fairly easy. For the wall balls I did the women's Rx with the 16lb ball! This was my first time using the 16lb ball, usually I use the 14lb ball but I think I just graduated to the heavier ball. I guess I will be doing the Rx now for wall balls but it was a challenge to throw the ball high enough! My shoulders feel okay though. After the workout, I drank about 20 oz of water, went home and had 2 scrambled eggs with 1 cup of chopped brocolli and my giant cup of chai (about 20-24 oz!). I make the chai myself with a Lipton tea bag, 1 cardamom seed, a small stick of cinnamon and 1/2 cup of skim milk, no sugar. I'm trying to not eat as much bread as I used to but I know I won't want eggs every morning and it's already been 3 mornings in a row, a record for me. I did a "long" run (long for me) in Umstead. We decided to do the Sycamore trail which is about 7 miles long, the terrain varies from nice flat pine needle covered trails to rooty, rocky obstacle course trails. It's a challenge but such a beautiful trail to run along since for a good part of it you run by a creek (I like hearing the water and having the water view). I thought that 3 hours would be enough time to recover from my 6AM Crossfit workout but I didn't have much power left in my legs, plus I could feel my right Achilles tendon getting tight and uncomfortable. So I took it extremely easy to make sure I could actually finish all 7 miles, which I did at the outstanding pace of 14 min/mile! It's slow, but the terrain was hilly and challenging and I was not going to push it when I have a race coming up on January 10th. I'm glad we did the run (with Lisa & Jim) but I need to work on my recovery times. According to Crossfit Endurance, three hours should be enough time in between a crossfit WOD and a run but perhaps I am one of those people who needs like six hours! I finished in 22:02. There were 8 people in the class today! I came in 2nd and probably could have beaten Matt for first place today but I was not up to going hard on the run. It seems like if I go very hard on the run, the next exercise is a big challenge and I end up losing time because my pace slows down considerably. I decided also not to go hard because I plan to run 7 miles later today. The step-ups were a challenge and on the last round, my right knee started to hurt during the step ups, so I did the last 6 reps starting from my left leg. I'm icing my knee now since I can feel it ache. 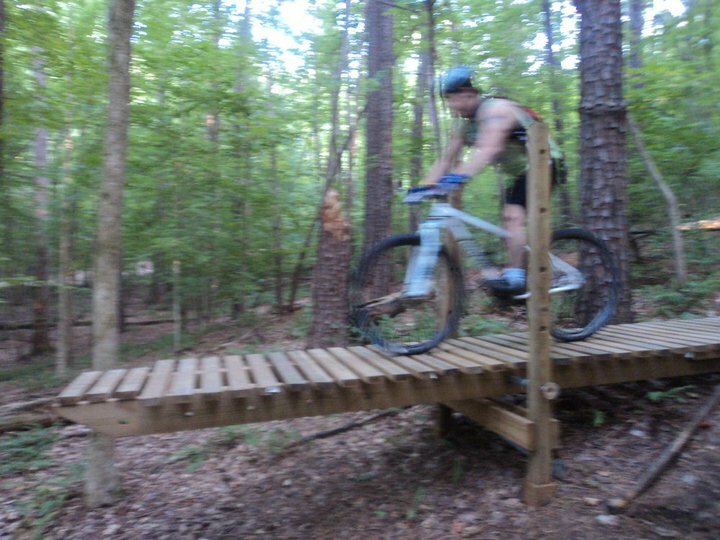 Okay, so even though my right knee has been hurting from biking, I thought I would try riding at Harris Lake State Park (New Hill, NC) with Jim and John to assess the adjustments the Bicycle Chain guy gave my bike. We ended up doing about 9.8 miles of fairly easy trails in 75 minutes. I didn't push it very hard, my knee tingled a little bit but there was no excruciating pain so I kept at it. I decided that from now on, I'd be wearing knee pads on most rides because I have managed to fall on my right knee consistently which probably doesn't help the healing process. Jim tried hucking off the big rock, I tried doing the dirt jump but I remembered how badly I fell this past summer so I ended up getting no air. I did do some of the double black diamond drops and surprised John by going down a steep downhill with no issues. All in all, it was a good ride and I had fun. I can't say it was a "workout" since I didn't push it very hard but it was pretty neat how easy it felt to do most things on the trail now, a huge difference from 2010. I've been googling to see what I can do about the pain in my right Achilles tendon and found Barefoot Running University. He suggests rolling the Achilles with a rolling pin and rolling the sole of your foot and your quad. We will see if it can cure my tendon pain. I did try rolling my Achilles tendon using the foam roller last night and it feels better but maybe the harder surface of the rolling pin will be more effective. My running buddy Lisa and I on Company Mill. My Christmas present to myself was a trail run at Umstead State Park. We did 5.5 miles of the Company Mill Trail which is hilly, rooty and rocky! Fun stuff. I practiced POSE running and trying to be light on my feet so the obstacles wouldn't hurt in my Merrell Pace glove shoes. I still have some pain in my right Achilles tendon, I'm trying to figure out what is causing the problem. It might be that switching over to barefoot running shoes leads to using muscles previously unused and starting out too fast with too much mileage. To address the problem, I plan to slowly increase the mileage in these shoes and will probably have to go back wearing my traditional North Face trail running shoes intermittently to prevent any further stress on my Achilles tendon. I suspect that I just need time to allow my Achilles tendon to stretch out now that there isn't a raised heel in my shoe. I went rock climbing at Triangle Rock Club last night for the first time in over a year. I tried indoor rock climbing a number of times last year at TRC with the local rock climbing meetup group, got belay certified and although it was fun, I just didn't want to invest the time and energy to get really good at it! I decided that my priorities were running, mountain biking and crossfitting. However, since I'm on a winter break right now, I thought it would be fun to try again since I've have a lot more upper body strength now. Rock climbing routes are numbered in terms of difficulty. I only did fairly easy climbs rated 5.6 and 5.8 but it was fun and not hard at all anymore. I remember sweating a lot last year just trying to do a 5.8 but that didn't happen this time. I don't think I'll be rock climbing much in the future but it was good to get out of my comfort zone. Sometimes you need to inject a new activity for fun and this fit the bill. It took me 40:15, longest crossfit workout ever! But I felt really good after it was over and am thinking I'm ready for the Suffer on Saturday workouts they have regularly at the Raleigh location of Forged Fitness. 30 box jumps (20" box, I was feeling off balance so I ended up doing 15 jumps, 15 step-ups). I feel pretty good and will be going to the extra Saturday workout special: 12 days of Christmas! I got off of work early today and was able to go for a run in Umstead State Park. Since I hadn't been running much, I chose to do what I consider is the easiest loop - Loblolly to Reedy Creek and loop back up the Reedy Creek Lake Trail. The run started off at the Reedy Creek entrance parking lot. I set my Garmin conservatively to 4 miles in 48 minutes. I kept a good pace the first mile but my back started hurting (I think from the deadlifts earlier this morning), so I had to walk a bit and then start jogging again. I ended up finishing in 49 minutes, but it felt great. It started raining a bit halfway through the run but it wasn't bad. On the weekend, I hope to do Company Mill ( a harder 6 mile loop). 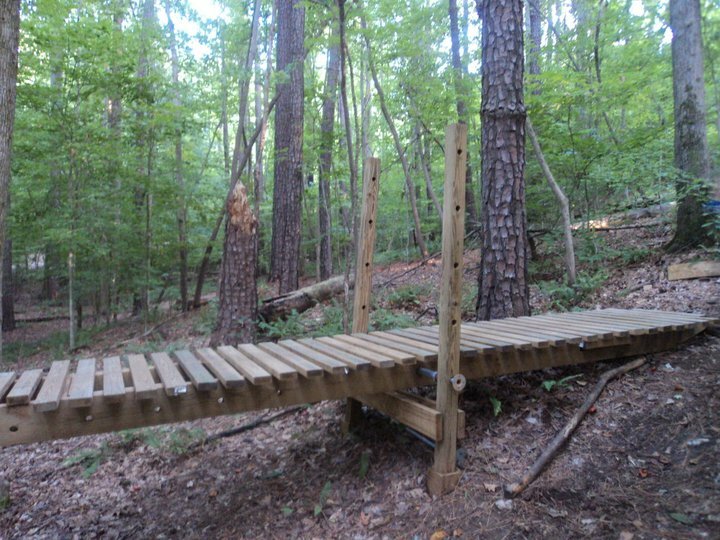 Umstead is great for trail running. It took me 17:55 to finish. The pull-ups were pretty hard today, I think I must have tired out my shoulders from the knees-to-elbows and presses earlier this week. The deadlifts got tougher each round and I probably should have dropped down to 115 lbs because my back started curving in the 6th round. It was a great WOD this morning: Run 1 mile and then do 30 Cleans. The Rx for women was 115 lbs but since I can't even do a good front squat at 100 lbs, this was not going to happen. I chose to do 75 lbs since I figured out last week how to clean properly. The 1 mile run was in the neighborhood up a big hill and back down to Forged Fitness. I did my best to run hard but my time was 11:36!!! I think the route they have us do is more than 1 mile and I plan to come back later this week and measure it with my Garmin. If it really is 1 mile, then I need to step it up in the running category. After the mile run, I started on my cleans. Mike G told me that after I finish a clean, I should just drop the bar in a controlled manner instead of gingerly putting it down. Once I got the hang of this, I had more energy and was able to do more cleans in sequence. My total time ended up being 18:52. Doni was nice enough to take some video of me doing two cleans after the WOD was over. I realized watching it, I didn't do a full clean (getting all the way into a front squat upon receiving the bar) so next time, I think I need to try a slightly heavier weight or at least remind myself during the move to fully squat. This is mainly to work on form and to be prepared when I do try heavier weights and have to do a full squat to get the weight up. I've started posting some of my own mountain biking videos on youtube. I found this really great video that gives all the information you need to improve your mountain biking skills. The footage and the explanations are outstanding, I'm going to try and apply the lessons to my own skills work. Stay tuned for some new video this coming week! The WOD for this morning was row 500M and 25 knees to elbows for 4 rounds. Since there were only 5 rowers and 8 of us, we split the group up so 4 people ran 400M instead of rowing. I decided to run since I didn't run at all yesterday and it was about 42F this morning- perfect running weather! I wore gloves this time because I knew hanging on the bar for 25 knees to elbows was going to scrape away at my palms, still hurt my palms but it was okay. I ended up finishing the WOD in 14:02. I stayed afterward to do some strict military presses with a barbell 5-5-5-5-5, the weights for each round: 33-45-50-55-60 lbs. I tried doing 65 lbs but failed! I will probably try again tomorrow to see if I can do a strict press at 65 lbs. Looking back at my excel file history, I did a similar workout up to 55 lbs and my one rep max was 60 lbs (Feb 2011) with a note that I tried 65 lbs and failed. There has been some progress, I can do 5 reps at 60 lbs but need to figure out if I can do 65 lbs at least once. The more I can do on the strict military press, the better my chances are for doing a dead hang pullup. I've got a long way to go! I bought a full-suspension bike earlier this year and it has been a lot of fun riding a full-squish bike. 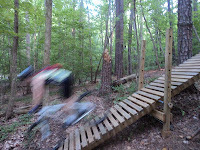 I'm more willing to try new things (logs, rock gardens, skinnies, etc) on this bike than I was on my old hardtail. Possibly because I now have disc brakes and 6" travel on the front fork. I definitely don't take full advantage of my bike so there is room to grow (how can you have a 6" travel fork and not try to do some jumps?). All in due time. Today was a lazy day and I went on a short ride near my home. The goal was to try the teeter totter today however when we got to the area, the teeter totter was gone! I'm not sure why they took it down but it looks like I'll have to look for another teeter totter elsewhere and hopefully get the nerve to try it :). We ended up doing 4.75 miles in 51 minutes (hilly). I finally can do the skinny and am getting over more logs now. One bad thing- I haven't ridden since last Sunday and it was obvious- the minute you stop riding, you lose stamina! I might have to break out the trainer if I keep wussing out of riding when it is cold or too dark! 6 AM class today with Jason as our trainer and a total of 8 people today! That's a big number for a Friday workout, usually it is just 2 people on a Friday. I love it when Jason is overseeing a class, he will make you work harder, communicate the correct form to use and just make you more effective! I've never worked with a coach before but working with Jason has been amazing. He is by far the best coach at the gym (I guess he should be since he is the owner!) and one of the main reasons I ended up joining Forged Fitness. And the other thing about having Jason as the trainer is that we tend to do more complicated/new warmups, today was no different. Our warmup consisted of 25 standing situps and 15 burpees. A standing situp requires a partner who sits on your feet and with straight arms grabs the back of calves. As you go up into a situp, the partner leans back with straight arms and helps you stand up while still holding onto the back of your calves, repeat. This was tough both as the partner and the person doing the situp! After doing this warmup, I felt like I had already exercised enough but the WOD was still waiting for us. Today's WOD was: 8 front squats (75 lbs), 15 ring dips (I used a band to assist me on the dips) and 400M run for four rounds. In order to do the front squat, you have to power clean or clean the weight up first. My cleans are not pretty and of course Jason pointed out that I was leaning back trying to get the weight up. I did better on the last 3 rounds and ended up finishing the WOD in 12:42 minutes. After the WOD was over, I rested a few minutes and asked Jason to watch me do a clean. He had me position myself with my feet about hip-width apart - first thing I noticed was that previously I was positioning my feet shoulder-width apart and bringing my feet in with toes pointed out was something I was not doing before. After positioning my feet correctly, I leaned down with bent knees but not squatting and powered the bar up with my hips and as it was coming up, I dipped and caught the bar correctly. Just positioning myself right allowed my feet to land in the right position to start the front squats! It was amazing, and I did it 3 more times perfectly. I know how to clean properly now! For the front squats, 75 lbs was challenging but doable. Jason still wanted me to squat deeper so I will continue to work on that. Great start to my day! Bench Press Max Effort. Did a 2 rep max for 5 sets. I could only do 60 lbs + the bar. I used the bar in my apartment gym which I suspect weighs 20-25 lbs so a total of 80-85 lbs. Upper body strength is still poor. I tried doing a dead hang pullup and maybe pulled myself up about 1 inch! More work to be done. Last night was the Forged Fitness Xmas party at Fubar. It was disconcerting seeing people in nice clothes with their hair down, it took a couple of minutes before I recognized them! I didn't stay late since I still planned on going to the 6 am class. The warmup today was jump rope for 2 minutes and 20 slamballs. I'm so excited about jump roping now because I think I have gotten the hang of a double under. Today I managed to link 3 double unders in a row before tripping up on the rope, progress is a wonderful thing! This morning's WOD was interesting. Jason set up a rope between two racks, the height was maybe 18-20" off the ground on one end and about 24" off the other end. This was for the over-under exercise, where you do a lateral hop over the rope, drop down into a pushup and slide or roll under the rope, and repeat. The WOD: 4 rounds of 10 over-unders, 10 bent-over rows (67 lb barbell), 10 weighted situps (15 lb dumbbell), 10 lunges (25 lb plate overhead, 10 lunges each leg so really 20 lunges). For the weighted situp, the dumbbell is always held upright and your arms stay in the same position throughout the situp. It took me 13:30 minutes to finish. The bent-over rows were pretty hard at 67 lbs but I'm glad I stuck with this weight. I think he's going to modify it to 5 rounds for the afternoon classes since it was a bit easy- my grade for this WOD is a B (yesterday's WOD was an A+!). I was a bit leery about doing the lateral hop over the rope but I realized that my jumping height has gotten pretty good and for 10 explosive jumps, I still had my balance and could power through them (if you go fast enough and are not used to the jumping, you can sometimes miscalculate and get caught in the rope, which can be scary because it could mean twisting your ankle). My running has tapered off due to daylight savings time and my own lack of initiative now that I have finished the Complete Runner Program. But my goal is to get faster or at least maintain my running fitness at its current level. This involves a couple of things: working on form using POSE, speed workouts and trail running. Tonight was a speed workout - specifically the tabata form where you run hard for 20 seconds, rest for 10 seconds and repeat 8 times with no pausing beyond the 10 second rest period. From the Crossfit Endurance website, the prescribed workout is 0-30 seconds slower than 5K pace per mile on a treadmill with a 12% incline. I don't really know what my 5K pace is so I picked something faster than my half-marathon pace and I set the treadmill at a 5% incline since this was to be my first tabata run workout. I warmed up for 4 minutes on the treadmill at a 12:00 mile pace then started the tabata run at a 9:05 mile pace and 5% incline. I felt pretty good so I ended up doing 10 rounds (instead of 8). I then cooled down for 5 minutes. Total workout was < 15 minutes. Next time, I'll try an 8:30 pace with an 8% incline. A 12% incline seems a bit too ambitious right now but it's in the horizon. There was no knee pain, calf cramping, or achilles tendon hurting during or after this run! I hope that means my form is getting better. I also need to sign up for a 5K race and just see how I do, it would be pretty cool if I could complete the 5K in under 27 minutes- this was beyond my imagination a year ago! A popular regimen based on a 1996 study uses 20 seconds of ultra-intense exercise (at an intensity of about 170% of VO2max) followed by 10 seconds of rest, repeated continuously for 4 minutes (8 cycles). In the original study, athletes using this method trained 4 times per week, plus another day of steady-state training, and obtained gains similar to a group of athletes who did steady state (70% VO2max) training 5 times per week. The steady state group had a higher VO2max at the end (from 52 to 57 ml/kg/min), but the Tabata group had started lower and gained more overall (from 48 to 55 ml/kg/min). Also, only the Tabata group had gained anaerobic capacity benefits.